The manic inventiveness of the minimalist theater company Bedlam has yielded rich dividends in productions like Sense & Sensibility and What You Will. When the troupe misfires, however, its battiness gets boring. 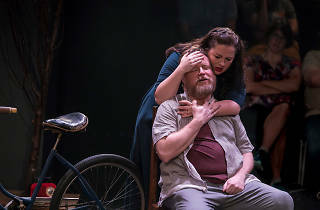 Five Bedlam vets, including director Eric Tucker, portray multiple parts in Uncle Romeo Vanya Juliet, a crash-up of Chekhov and Shakespeare with an emphasis on the former: It's a vodka martini with the Bard as the vermouth. Unfortunately, this dramatic cocktail does little to bring out the shows' shared themes of passion, obsession and betrayal. 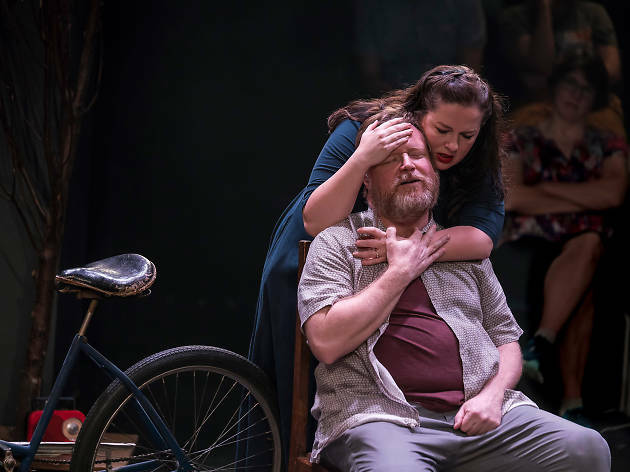 During Act I, Kimberly Pau's new translation of Uncle Vanya is played broadly and frantically in the round, on a raw stage peppered with trees on rollers. Those unfamiliar with the text will get lost fast in the forest, even before Romeo and Juliet kicks in. Edmund Lewis earns a few laughs as the forlorn Vanya and his nagging mother, but Tucker's Astrov seems glib, Susannah Millonzi's Sonya wallows in self-pity and Randolph Curtis Rand's professor barely registers. Only the luminous Zuzanna Szadkowski manages to create a complete character as Yelena. With her husky inflections, expressive strut and sleepy-sad eyes, it's no wonder she's the object of all the men's desires. Szadkowski also makes a fetching Juliet in the second act, when the trees have been replaced by Cold War–era metal desks because…who knows? So many choices in this overlong acting experiment raise that question. Bedlam's M.O. is to crack open classic texts and discover something unexpected and resonant inside them. But beneath a few nifty performances, there's nothing at the center this time. Like the balloon that inexplicably hovers just a few inches above the stage, Uncle Romeo Vanya Juliet is both lightweight and deflating. A.R.T/New York Theatres (Off Broadway). By William Shakespeare and Anton Chekhov. Directed by Eric Tucker. With ensemble cast. Running time: 2hrs 30mins. One intermission.